Dressing for winter weather is more than just throwing on a coat before you head outside. 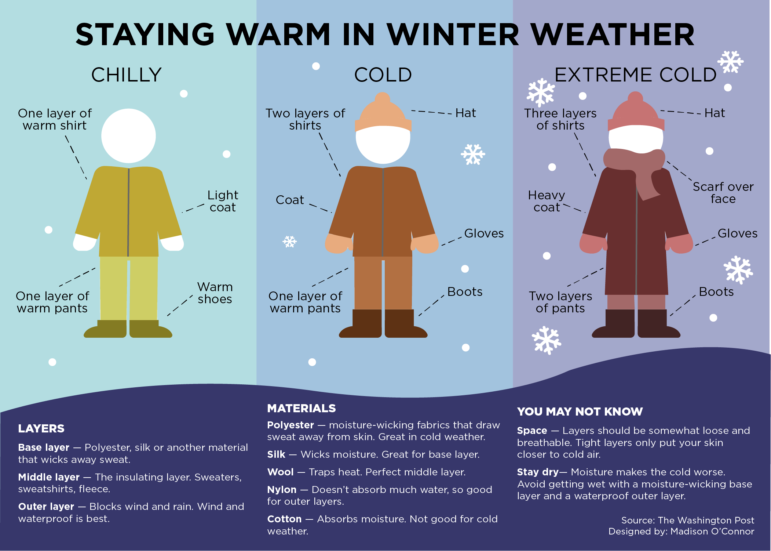 Knowing how to bundle up for different weather conditions will keep you warm and safe no matter what Mother Nature throws your way. EAST LANSING — This year’s polar vortex ransacked the Midwest Wednesday and Thursday, but by the weekend, was replaced with warm air and sunshine. In a span of just three days, East Lansing temperatures went from bitter to balmy in what meteorologists call a “remarkable” occurrence. “It was coldest air mass since 1994, and for it to bounce back from that in three days and go up to record warm temperatures, that’s even more remarkable,” said Cort Scholten, a meteorologist for the Grand Rapids National Weather Service office. The Grand Rapids office also serves Lansing and East Lansing. Three temperature records were broken in the Lansing area during the week, Scholten said. First, Wednesday and Thursday as individual days had the lowest high temperatures recorded in Lansing’s history. On Wednesday, the highest the temperature got was 3 degrees, which beat the record of 5 degrees on that day in 1899, Scholten said. Then, on Sunday, Lansing had its record warmest low temperature for the date at 38 degrees, meaning the temperature on Sunday never dropped below 38, Scholten said. That broke the record of 35 degrees in 1991. The term “polar vortex” became popular during the winter about five years ago. It’s actually a meteorological phrase, Scholten said, and describes the strong winds in the upper atmosphere that circle the North Pole. Those strong winds hold frigid Arctic air, which tends to stay in northern Canada and Siberia. When the polar vortex is strong, temperatures in the U.S. are mild, Senior Climate Scientist for the Union of Concerned Scientists Brenda Ekwurzel wrote in “Winter Storm Jayden, the Polar Vortex, and Climate Change: 3 Factors that Matter.” But when the polar vortex is weak, that’s when the mass will buckle. The buckling meant temperatures plummeted across the Midwest, including in East Lansing. But immediately following the cold air masses came balmy temperatures. But should the quick bounceback from such cold temperatures be of concern? It might mean more potholes, Scholten said. Potholes tend to form when there’s a freeze-thaw cycle followed by rain and more low temperatures, just as East Lansing faces now. Flooding could also occur when sheets of ice and a heavy snowpack melt and lead to localized flooding, Scholten said. For East Lansing, flooding is less of a concern. With the polar vortex in the rearview mirror, now East Lansing residents have to prepare for freezing rain and ice throughout the week. Headed into the rest of the winter, snow, ice and low temperatures could definitely make a comeback. If and when winter storm warnings return, Ready.gov’s “Snowstorms & Extreme Cold” webpage suggests the best ways to stay safe are to stay off the roads, stay indoors, prepare for power outages, watch for emergency alerts and look for signs of hypothermia and frostbite. “The active weather continues, but the first concern is (Tuesday night) with the ice that’s headed for Lansing,” Scholten said. Madison O'Connor is a junior at Michigan State University pursuing degrees in journalism and user experience. She has interned at the Lansing State Journal and MLive.com/The Grand Rapids Press. Prior to her internships, she worked at The State News as the campus news editor and the lead reporter on MSU's administration and the Larry Nassar cases. She has spoken at several journalism conferences. Madison strives to find answers to complex questions through empathy. Lansing Mayor Andy Schor proposed a plan March 25 to use 100 percent renewable energy for all city government buildings. This would make Lansing the first city in Michigan to do so.